Drone comb, which really does look like Kix! A couple of weeks ago, I opened up my hive to find that the bees were making drones. Lots of them, exclusively on the brand new foundationless frames that I had put into the hive the week prior. There was worker brood on the frames with foundation, and I spotted my queen, so it wasn’t a problem with a laying worker. However, since I had been expecting lovely new comb and maybe even some honey, I was surprised to find this ugly comb riddled with kix-cereal type cells. It seriously made me start to itch. To find out what my bees might be up to (hello…bees? I was feeding you until 10 days ago! Why are you wasting time making drones?) I emailed my beekeepers’ group. I lamented my bees’ choice of activities. Drones are a waste of resources! How could they? When are they going to start making some honey???? Hm, so you think the bees are making a big mistake? Why do you think that? In my pre-child life, I was a midwife. I helped mothers bring new life into the world primarily through the wisdom handed down by generations of women giving birth and attending births, and confidence in the natural process. One of the best pieces of advice I received from a midwife-mentor was to practice “sitting on my hands.” This was not an easy concept for me and was one that required me to majorly shift my thinking. I am not a naturally patient person. I like to help, manage, organize and myriad other “action words” in which a person with a busy brain might engage. However birth can take a long time and a good midwife does well to remember that sometimes all that is needed is tincture of time. It can be very tempting to try to hasten a birth by offering interventions. However, many of these interventions cause further interventions to be needed, and then instead of helping a mother follow her instincts and the natural flow of birth, you create a situation that needs medical intervention. Counterproductive to say the least. Patti’s comment brought me back to that sage midwifery advice. Why did I think I knew better than the bees? If I had learned not to think that I knew better than a mother giving birth, why would I not extend that trust in the natural process to the hive? In the past few months since I started caretaking my hives, I have been surprised at how much of what has been studied about honey bees and beekeeping practices has been done in support of industrial agriculture and commercial beekeeping. Commercial beekeeping uses medications, artificial feeding with tanker trucks of corn syrup, and bees as tools in large scale agricultural pollination with little thought given to their nutritional needs. Some beekeepers expect to lose their hives every year. They basically just work the bees to death and don’t give them the time or resources to prepare their hives for winter. From the sounds of it, not much attention is paid to the bees’ perspective. It is mostly about the convenience for the beekeeper and the farmers. Which sounds a lot like what has happened to birth. Women delivering flat on their backs for the convenience of the doctor. Inductions and C-sections scheduled to fit someone’s calendar rather than with thought given to the needs of the baby. Drugs given to laboring women instead of support and encouragement. Interventions introduced well in advance of any indications that they are needed, and without trying natural solutions first. I know full well that there are instances in which medical interventions are necessary for mothers and babies. They do save lives. But for most healthy women and their infants, these interventions are not needed. If 1 in 3 women actually required a C-section to give birth to a healthy baby, our species never would have made it this far. 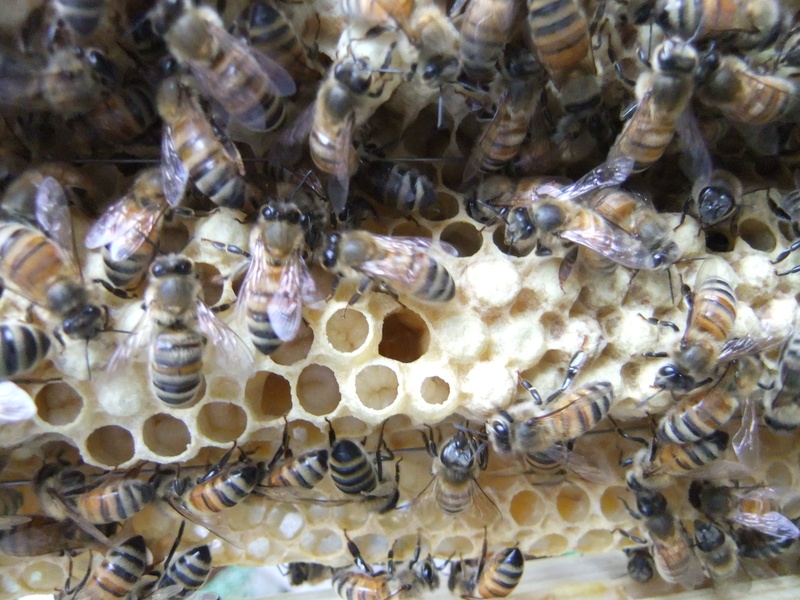 But it does seem to me, given that we are still dealing with Colony Collapse Disorder and worrying losses of honeybee hives, that it is high time to start thinking like midwives when it comes to our beekeeping practices. To think about what is normal, what is natural, and what is best for bees. To ask ourselves the hard questions about why we are following certain practices. To be willing to give an honest look at our assumptions. To stop and be reminded of Patti’s question: So you think the bees are making a big mistake? Why do you think that? It is humbling to be asked that, and humbling to realize my own hubris. That after one season of beekeeping (or even after 10!) that I might think I know better than my bees. As with the women I attended in labor, I could never know better. I can only be there to create an environment for the hive that functions as naturally as possible. To know enough about what is normal to recognize the problems. And to sit on my hands longer than feels comfortable so that my bees can have a fair shot at resolving the problems themselves.